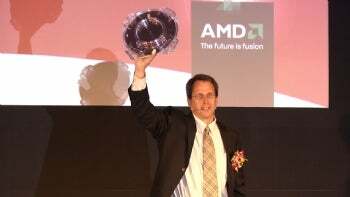 Rick Bergman, senior vice president and general manager of AMD's products group, holds a wafer of AMD Fusion chips during a news conference in Taipei on Tuesday, June 2, 2010. Bergman also showed off a silicon wafer filled with Fusion chips during his speech, but the company wouldn't let journalists take pictures of the wafer during a photo session held later. The reason for so much secrecy, according to one AMD executive, was the fear that a high-definition photo of the wafer would find it's way into the hands of Intel.